What can be better in the summer than cold juicy ice cream? Only an ice cream that you will make yourself. To tell you the truth, before I did not dare to make an ice cream, everywhere in the recipes they talked about cream freezers (machines for ice cream preparation). Actually, everything is quite easy – the main rule of cooking ice cream is not to let ice crystals form. That is what home cream freezers do constantly mixing the mass, breaking the ice crystals. Quite the same thing you can do using a spoon! 1. Buy a fresh mango, dice it and freeze in the fridge. The method is very simple: blend a frozen mango with a blender and then add some yogurt (better without smack and fatter 2.5-4%), honey, mint and other flavors. Mix well one more time. It is better to add honey and yogurt gradually in small portions to obtain the desired taste and aroma ratio. Do not be quick to pour everything in blender glass all at once. 2. Depending on the degree of mango icing, you will have a more or less viscous texture. You can serve such a dessert at once. If you want to prepare more – just put the mass into a freezer and mix it carefully every hour until it totally freezes. 3. Here the rule of a large area of the product works well - blended mint leaves give an incredibly strong flavor. 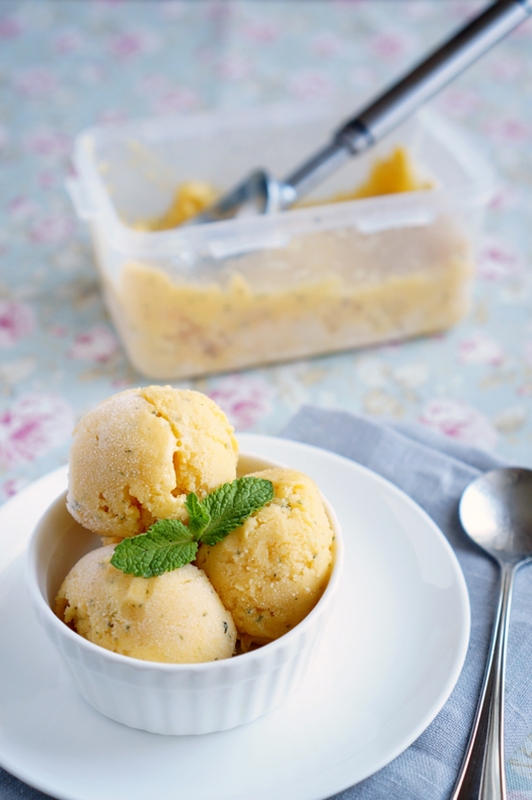 You can make a similar ice cream with melon, pumpkin and other dense fruits. However, if you take an orange or something very juicy - it will turn out to be more sorbet, but we will talk about this another time.